Seattle isn’t all grunge rock and coffee, though those are two of the more fabulous things to come from the Emerald City. Other noteworthy things that started out in Seattle? Microsoft, Nordstrom, Costco and me. I decided to make a solo journey home with two of my boys so they could see that ferries really do carry cars and Ivar’s clam chowder makes East Coast versions taste like school paste. The heart of Seattle, in my opinion, is the Pike Place Market. Before it was made famous in movies such as “Sleepless in Seattle,” it was where I spent every Saturday morning, stocking up on vegetables and fresh flowers. Until recently, there weren’t many luxury hotel options near the market. 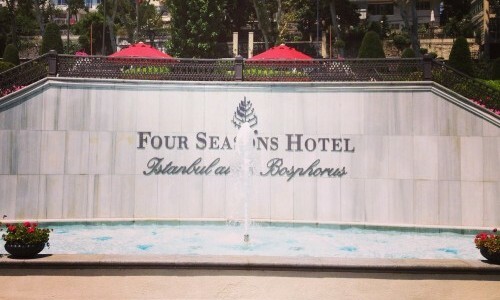 Then the Four Seasons built a brand new world class hotel right next door. Four star accommodations and The Flying Fish Company on the same block, a dream come true. There were cookies and milk waiting in the room, a blessing for hungry tummies that don’t think the “snacks for purchase” on our flight counted as food. A little stuffed animal for each boy. Bedtime in a strange room in a foreign city is always difficult. A friend to cuddle with makes it a little easier. A miniature robe and slippers, complete with Four Seasons logo (of course). 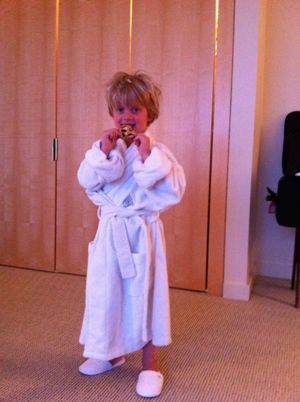 Keaton spent the rest of the week looking like a mini-Tony Soprano in his tiny lush robe demanding room service. The bellman who took us to our room offered to keep the stroller downstairs so it wouldn’t be in our way. I never would have considered asking. I really don’t think I’ve ever been to a property, luxury or otherwise, that was so focused on making traveling with children easy. That it oozes refined coziness and breathtaking views of the bay make it the perfect luxury family vacation spot. The Four Seasons Seattle has the only outdoor hotel pool in the entire city. Really. The pool is heated to a toasty 85 degrees. That wasn’t always warm enough for the boys in March. Lucky for them there is also a hot tub and an eternal fire pit, all with expansive views of Elliot Bay and my old apartment in West Seattle. The boys’ favorite thing about the hot tub is that room service delivers tub side. In true mini-“Arthur” style they enjoyed their Space Needle Sundaes wrapped in cotton candy while soaking their tiny toes. In the summer the pool becomes a mini-resort, a good reason to go back. There is plenty to do in Seattle with kids. After a day of sightseeing with mini people, the concierge is happy to arrange a babysitter so you can slip downstairs to the tranquility of the spa. Some of the treatment rooms have that same impressive view and they all have heated tables and cozy blankets. If you’re thinking of a luxury family vacation in Seattle, book the Four Seasons, leave your umbrella at home and make space in your suitcase to bring home some fish from The Flying Fish Company. They don’t make it fly unless you buy, and trust me, it’s worth it. We were the guests of the Four Seasons Seattle for one night of our week long stay. I was not compensated and the hotel did not ask that I express any certain point of view. The love I have for it is all my own.